Nansemond River Lighthouse was built in 1878 near Pig Point on the eastern side of the entrance to the Nansemond River in Suffolk, Virginia. It was a white hexagonal woodpile lighthouse. It had a sixth order Fresnel lens. The lens was replaced in 1899 with a fifth order Fresnel lens. The lighthouse was assembled at the Lazaretto Depot in Maryland. 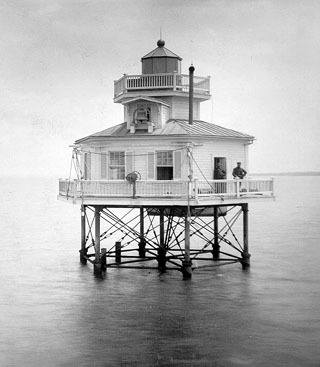 It is noted that some parts of the lighthouse came from the former Roanoke Marshes Lighthouse in North Carolina. The lighthouse was deactivated in 1935 and dismantled. It was replaced with an automated light on a steel skeleton tower erected on the original foundation.